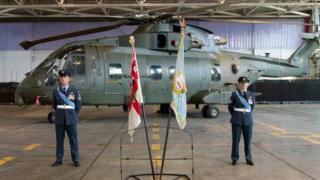 Prince Michael of Kent attended a parade to mark the end of service of Merlin helicopters at RAF Benson. The last of 25 Merlins have now been transferred from the Oxfordshire base to the Royal Navy's 845 Naval Air Squadron. The prince was joined by senior officers at the ceremonial parade and Merlin flypast on Thursday. RAF Benson will continue to operate Puma helicopters and, from the autumn, a fleet of six Chinooks. Wing Commander Martin Lock said: "It is a new chapter in both air force and navy history. The Merlins have served the Royal Air Force extremely proudly both at home and in operations. It's a sad moment, but a proud one." RAF Benson marked 10 years of continuous operations for the Merlin helicopter in 2013. The first operational deployment by the squadron with its Merlins was made in 2003 when aircraft commenced operations in Bosnia. Video How do you get a Merlin helicopter to Afghanistan?